Healthwatch Blackpool is a public voice on health and social care. This means that we represent the interests of the residents of Blackpool. 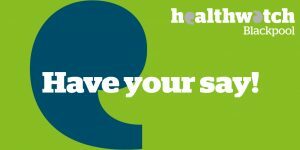 Healthwatch Blackpool makes sure that your views on health and social care services are listened to by those who manage and run local health and social care providers, report concerns to the health regulator, the Care Quality Commission, and feed intelligence on a national level to Healthwatch England. Healthwatch Blackpool gathers intelligence by engaging with residents, listening to comments, compliments and concerns and ensuring that these views and experiences are heard by those who run, plan and regulate health and social care services in Blackpool. Represent the views of the public via Health and Wellbeing boards set up by local authorities. Report concerns about the quality of health care to Healthwatch England, which can then recommend that the Care Quality Commission take action. Identify local and national trends and raise awareness of these to the relevant organisations. Signpost members of the public to services in Blackpool including information services, clinical commissioning groups, complaints and advocacy services. Work in collaboration with health and social care providers in Blackpool to ensure comments are listened to and to promote best practice. Develop creative projects and activities to capture views of vulnerable people in society or those who are seldom heard.